I’ve had the pleasure of being invited as a Cosplay Guest to the Showmasters Events Bournemouth Film & Comic Con this March. I’m Dax79, an Award-Winning cosplayer who has been cosplaying for 20 years but only competing since 2014. I mostly build armor and my favorite materials to work with are cardboard, EVA foam, and Worbla. I’m also known as Dax79 Cosplay. Here are your Masquerade Judges! SqueakehB, VanillaPink Cosplay and I, Dax79 Cosplay! Great news! online sign up for the Cosplay at Showmasters masquerade is now open! Follow the link below to get your entry in. I look forward to seeing you at Film and Comic Con Bournemouth 16th and 17th March at B.I.C. So get them glue guns out! If you have any questions about entering please contact Cosplay at Showmasters! What will Dax79 be doing? I will have a table in the Cosplay Zone. I will be free to talk cosplay, I will be bringing my 3D printer with me that will involve my cool giveaway. I will also have some prints available. So come say HI! 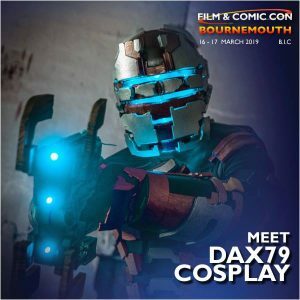 This entry was posted in CONVENTIONS, Guest Appearing and tagged Bournemouth, Cosplay, FCCB19, FCCBournemouth, FilmAndComicCon, masquerade, online, watchthisdeadspace. Bookmark the permalink.